Amos McGee Review: A Sick Day for Amos McGee reviewed here. Amos McGee Review: I've slowly warmed to this book. My first impression was that Amos McGee is a simple story of a kindly old man with a cold who is visited at home by his zoo animal friends. Hmmm, yep cute, nice. Seen it before. But it's more than that. A Sick Day for Amos McGee has a unique feel and style that is only revealed gradually. Well, at least that's how it was for me. The book is ultimately about friendship. And how friends miss us when we are not around, and how they care for us when we are not well. Young children will respond to this message and also to the beautifully drawn images of Amos McGee's friends, the zoo animals. Each animal has a character and soul that is most evident in the expression of their eyes. The animals - an elephant, a rhinoceros, an owl, a tortoise and a penguin - look to be as old as Amos McGee and to have lived a long life, and experienced many life events. It's a remarkable artistic feat given that such depth of emotion has been evoked with a few fine pencil strokes. In fact one of the great strengths of the story is the understated elegance of the illustrations. Colour is used sparingly and the illustrator, Erin Stead, leaves large areas of canvas white and untouched. The effect is to focus the reader's eyes on the blocks of colour, and to the many subtle details sculpted in delicate pencil. 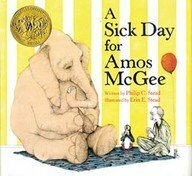 A Sick Day for Amos McGee has a timeless feel to it. At heart, it is a simple and gentle tale about an old man visited by his animal friends. But at a deeper level it is a beautifully imagined story, which has been lovingly crafted into a true work of art. Highly recommended for ages 4 - 8 years.